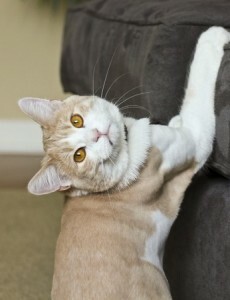 How many times have you had to try and scare your cat away from clawing at the edges of your couch or other furniture? Cat scratches can quickly turn your fine furniture into tattered fabric, ruining the nice looks and comforts of your home. There are many methods to use to deter your cat from scratching, however, which are safer and more humane than having him or her declawed. Take a look at these four great alternatives. One obvious solution is to provide your cat with a designated alternative place to do their scratching. Scratching posts are the time-tested option. Often covered with carpet or filled with corrugated cardboard, these surfaces provide a guilt-free option that you can set up for your cat to enjoy. If your cat tends to scratch in a particular area, Drs. Foster and Smith recommend moving your new scratching surface to near that spot. For an added incentive, sprinkle a bit of catnip on the new post to entice your cat to use it. Of course, adding a new post won’t suffice if your cat still prefers your furniture. This is where a spray deterrent comes in. There are several methods that can work here. For starters, you can look for a special herbal spray or pheromone-based. These are available in many pet stores and shops, and emit an odor that acts as a deterrent to cats. You can also use an orange, lemon or other citrus spray solution, as cats are naturally adverse to the smell of citrus fruits. Lastly, the classic spray bottle: If your cat scratches where you don’t want him or her to, spritz them once with a burst of water from a spray bottle. Your cat will soon associate the action of scratching with suddenly getting wet, and will stop their behavior. Be careful to try and not let them see it was you, though, as they may associate the water with you, and not the activity. Another way to deter cats is to make the previous scratching surface less physically appealing. Double-sided tape is a great option for this. Place the tape over where you cat has been scratching your furniture and when your cat goes to latch on to their favorite part of your furniture, they’ll get a sticky sensation instead. Cats hate this sensation, and will quickly seek out a new place to sink their claws into instead. Double-sided tape can also work well to keep cats off surfaces, like the fronts of television stands or counter tops, so you may even be able to reclaim other areas of your home from your feline friend using this method. The final recommendation is keeping your cat’s nails regularly trimmed. Trimming the nails helps keep them at a more manageable length, making them less sharp for scratching both your furniture and you during playtime. The process is not as difficult or harrowing as it might seem at first. While both cat’s nails and dog’s nails do have live nerve endings – known as quick – it is easy to avoid hitting these areas with practice. WikiHow offers a fantastic and thorough guide for beginners that can help walk you through the process for the first time. Regardless of the method you choose, keep in mind that cat’s scratch instinctually as part of their natural behavior, and no deterrent will be 100 percent effective. These options will help minimize the scratching, though, and help keep your furniture from becoming cat-shredded fabric.